Today I am delighted to introduce one of my fellow Accent writers, the brilliant Betsy Tobin. Here’s a book that would be a welcome addition to any Christmas stocking! Sometimes we writers must meticulously concoct the plots of our novels from a vast cauldron of raw ingredients. And sometimes the story is quite literally handed to us on a plate. Happily, such was the case with my latest book, THINGS WE COULDN’T EXPLAIN, a comic novel about Virgin Birth. More than a few years ago, I sat down to write a novel about faith in America. I knew the story would revolve around a small town in the Midwest besieged by miracles. And I knew a handful of other details: it would be set in Ohio in the late 1970s, the landscape of my youth; and the story would feature a young, blind protagonist. (Mistakenly I thought this might absolve me from writing a lot of physical description—how utterly wrong I was!) Lastly, I knew the plot would involve both a miraculous conception and a series of Marian apparitions. Some of the most famous examples have taken place in relatively exotic locales (Japan, Rwanda, Bosnia.) And not surprisingly, most have occurred in countries where Catholicism is widely practiced: France has more than its share, as does Portugal. But as this was an American story, I focused on those that had taken place in the US. Within a few days I turned up a relatively obscure news item from a small town in northern Ohio. Hallelujah! The headline read: Curious and faithful flock to shrine where teen reported heavenly visit. 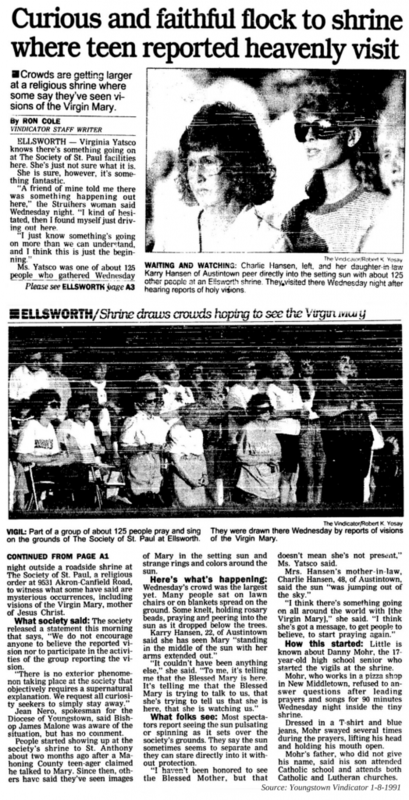 In the tiny town of Ellsworth, Ohio, over the long, hot summer of 1991, local residents claimed the Virgin Mary appeared regularly in the sunset over a two-month period, and a teenage boy took to preaching nightly to the crowds that gathered there. The sightings were never investigated, much less authenticated, by the Catholic Church, and the story was never covered in anything but the local press. At the end of the summer, the apparitions ceased. Betsy Tobin’s THINGS WE COULDN’T EXPLAIN is published now by Accent Press. Many thanks for dropping by today Betsy – Happy Christmas! I love the ideas behind this novel and Betsy , I wish it every success. I am looking forward to reading it soon. What a fascinating post and an intriguing story! I wish you all the best with your novel, Betsy. I have Things We Couldn’t Explain on my Kindle, Betsy, and I’m really looking forward to reading it. Thanks for the fascinating post. Best of luck with your release!